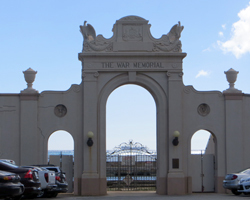 Natatorium War Memorial: A Piece of Hawaii History in Waikiki. Waikiki War Memorial Natatorium Remembers Better Days! Unfortunately the Natatorium can’t really be called a Hawaii attraction anymore. So this page is really more of an answer to the question: “Hey, what’s that thing over there next to the Waikiki Aquarium?”. That thing – which looks like beachfront bleachers – is the crumbling remains of a once great swimming stadium called the Waikiki War Memorial Natatorium. Built within Kapiolani Park as a monument to Hawaii’s 10,000+ World War I veterans, this 100-meter seawater swimming pool hosted aquatic legends such as Hawaii’s own Duke Kahanamoku and 34 other members of the Swimming Hall of Fame. The defunct Hawaii attraction looks like it could be one of the really fun things to do in Waikiki! But I can’t say for sure, because this facility has been closed, due to lack of maintenance, since before I arrived on Oahu in 1981. Pretty lame. There have been efforts to restore this historic Hawaii attraction. Renovation began and then halted again. Funding was appropriated and then used elsewhere. And people still vocally support both its preservation and its demolition. 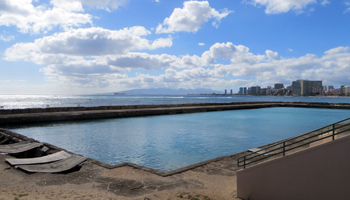 As a result, the Waikiki War Memorial Natatorium remains on the National Trust for Historic Preservation’s 11 most-endangered list (named in 1995). I honestly wish there was more to tell you about this once great Hawaii activity. But until somebody firmly commits to the idea that it’s worthwhile to repair and renovate, this attraction is little more than a political hot potato destined to remain a relic from Hawaii history. 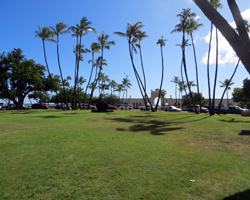 In the meantime, the portion of Kapiolani Park directly fronting the facility remains a popular place for cookouts and parties; and the strips of sand on both sides are as well-utilized as any other part of Waikiki Beach!